Broadening its reach into Europe the World Poker Tour (WPT) has added a new tournament series that will be held in Amneville France, from October 30th through November 6th. The week-long series will culminate with a €3,500 Main Event Championship that will begin on November 2nd. The tour has also recommitted to holding an event at the Aviation Club in Paris France, one of the first, and most popular stops on the WPT. Amneville is located in the northwest region of France, in close proximity to numerous other countries; Luxembourg, Germany, Belgium and the Netherlands. With a small buy-in for the championship event and qualifiers already running, the tournament will likely be one of the most well attended in European poker history. European stops on the tour now include: Paris France, Amneville France, Bucharest Romania, Cyprus, Bratislava Slovakia, Barcelona Spain, and Venice Italy, along with a stop in Marrakesh Morocco. While turnouts and popularity pale in comparison to PokerStars European Poker Tour, the WPT definitely has a strong foothold in the European poker market, and the new owners of the WPT, Party Poker, will likely make a major global push with the brand. 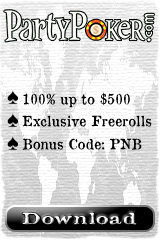 Trying to let players know they are the best online poker site plus also have the best Casino Online. This entry was posted on Tuesday, April 20th, 2010 at 5:00 pm and is filed under Poker News. You can follow any responses to this entry through the RSS 2.0 feed. You can leave a response, or trackback from your own site.